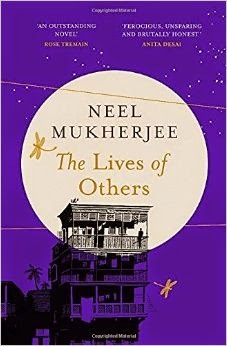 Neel Mukherjee's second novel, the Booker-longlisted The Lives of Others, is not a typical family/state drama. From its opening prologue, from whence the quote above comes, Mukherjee makes it quite clear that he is going to explore, sometimes in graphic, violent detail, the inequalities in mid-20th century Calcuttan/Kolkatan society. It certainly is a bold choice, as the story gains much from this unflinching portrayal of the hypocrisies and sufferings of Bengalis in this region of India. The Lives of Others (a title derived from an epigraph taken from James Salter's Light Years) opens with an explicit depiction of suffering and casual cruelty, as a starving tenant farmer, Nitai, after being denied the food necessary to keep his family alive, goes home and decapitates his wife and son, strangles his daughters, before committing suicide by drinking pesticide. Mukhejee displays the farmer's human frailty in this last, violent act of desperation and it is that sense of gross injustice, of people starving and committing mercy murders, that carries over into the main narrative as a lingering ghost, reminding readers that behind the depictions of the various lives of the well-to-do Ghosh family there lurks a specter of famine and deprivation much worse than what these family members manage to do to one another. However, this is not to downplay the intricate relationships that Mukherjee explores within the Ghosh family. On the contrary, this fictitious family encapsulates well many of the divisions present in Indian (and in particular, Bengali) society in the first generation after independence. While the character types might be of stock appearance (the self-made wealthy patriarch, the divisions among sons, the favored and ill-favored daughters, the black sheep revolutionary), he manages to enliven them with personalities that are vivid and which serve to draw the reader closer to the unfolding narrative. The novel's structure supports Mukherjee's exploration of societal injustices. In addition to traditional chapters detailing the lives of the Ghosh children living in their Kolkata compound, there are short commentaries, presented in a different font, that we later learn were composed by the rebellious son, Supratik, who has renounced his social station and has become a Maoist rebel. Mukherjee utilizes these different narrative threads to great effect, as he shows through each Ghosh son and daughter the intricate web of responsibilities and privileges, of petty power struggles and denials of affection due to differences in appearance and social grace. These characters, including the waspish Chhaya, whose stinging spiteful remarks serve as a goad to drive others away (or toward what she desires), drive the action of The Lives of Others and make for quick page turning. The prose for the most part is striking for its simple yet vivid quality. Mukherjee describes his characters and scenes in such a fashion that it is easy to imagine certain sights, sounds, and smells. There is little wasted space; the descriptions are lashed to the plot so tightly that everything seems to be subordinate to outlining just what is happening to the Ghosh family during the time of famine and social upheaval in West Bengal. This results in a novel that manages to create a series of contrasts between characters and their social counterparts without feeling either too spartan or too lush with extraneous detail. In addition, these clashes are set up in such a fashion that Mukherjee is able to make several pointed comments on contemporary socio-political issues (mostly through Supratik's changes in perspective during his years as a rebel) through the Ghosh family dynamics without reducing their conflicts to mere analogies for the greater conflict. If there were a difficulty to point out, it would be a very minor one: an Anglo-American reader might find herself needing to rely more on the helpful family chart at the beginning of the book and the glossary at the end, due to the different nature of Bengali familial relationships. Yet this was no real hindrance to enjoying the novel, which might be one of the best Indian family/societal dramas that I've read in years. The Lives of Others certainly is worthy of consideration for the Booker Prize and it wouldn't surprise me one bit to see it make the shortlist later this week. It's been long since I felt so satisfied having completed a book. A wonderful, intelligent book.